169 p., 15,5 x 23,0 cm. With contributions by Günter Abel, Georg W. Bertram, Rolf Elberfeld, Petra Gehring, Michael Hampe, Theo Kobusch, Ralf Konersmann and Pirmin Stekeler-Weithofer. This article develops foundations,pr oblems and perspectives for systematic knowledge research. Topics include: I. Knowledge: 1.Concepts and kinds of knowledge,2. Problems,pr ojects,and perspectives: (a) Knowledge and information. (b) Opinion,belief ,knowledg e. (c) Dynamics of knowledge. II. Science: 1.What is ›doing science‹? 2. Biotope as scientotope and technotope. 3. Unity of science? 4. Disciplinarity,inter disciplinarity,tr ansdisciplinarity. III. Orders of knowledge: 1.Orders of knowledge to a human scale. 2. Orders of knowledge rooted in everyday-life. 3. Transformation of knowledge orders. 4. Pragmatic and functionalist temporary orders of knowledge. IV. Knowledge research. It is well known that Kant talks about the categories of singularity,particularity and generality. But whereas most readers understand the latter as universal quantification,we better follow Hegel and read it as a label for normative systems of generic inferences. They define the conceptual content of words by reference to some corresponding general knowledge. A dialectical ›logic‹ of the word »but« tells us that we have to make exceptions from paradigmatic cases explicit when we apply general concepts to singular cases. As a result,we can see that not only Platonistic realism,b ut nominalism and empiricism as well,misunderstand the logical and ‚onto‘logical (i.e. world related) status of so-called universals and Aristotelian substances (ousiai). It is a scientistic misunderstanding to interpret natural languages as theories,a misunderstanding to be found in present semantic holism. It is also a misunderstanding to interpret philosophical texts as explanatory theories,because this view leads us historically astray and narrows the agenda for contemporary philosophy unnecessarily. It is argued that there is a difference between certainty in science and matters of course in the ordinary. Following Tarski truth in formal and natural languages is distinguished,in order to make sense for the ordinary and artistic search for truth. To refuse seeing natural languages as theories leads, as is shown following Dale Jacquette,to a new view of the conceptual form of perception: perceptions are theory-laden only insofar as they are part of scientific experience,otherwise they are structured by forms of everyday life. The paper concerns the relationship between philosophy and art. For this purpose, my considerations start with the question of art as a cognitive practice. Dealing with the aesthetics of Adorno und Goodman,I argue that art is intimately related to a specific form of practices of understanding. I hold that the specific form of the relevant practices of understanding can only be grasped if one conceives art as a reflective cognitive practice. Art is an aspect of what it means to be a self-conscious being. The relevance of art for the concept of a selfconscious being has consequences both for the philosophical conception of human mindedness and for the self-understanding of philosophy as a reflective cognitive practice. The article discusses the philosophy of the art of living and the question of the uniformity of its tradition. Recent critics of the modern art of living failed to take into consideration crucial ideas of the ancient and mediaeval understanding of the art of living. The ancient and mediaeval concept of a particular ›form of life‹ did not imply an aestheticization of life or the assumption that one could deliberately shape one’s life like an artifact. It ought be understood,r ather,as a moral self-formation of the subject,based on the Socratic thought of the care of the self, with a particular emphasis on the concept of attention. This conception has consequences for the understanding of self-discovery and individuality. In this context, the self-transformation of the soul in Gregory of Nyssa and the concept of equanimity in Meister Eckhart deserve a reappraisal. Reconceptualisations of the concept of ›life‹ in philosophical,scientif ic and political discourses around 1900 tended to abolish traditional oppositions of nature and culture or the social sphere. They were closely linked to an emerging interest in ›values‹ in a very fundamental sense as well as with a new pathos of ›reality‹,str essing the need for ›action‹ and ›power‹. This development can be conceived as the formative phase of the merging of sciences,social policies and ethics now known under the title of ›life sciences‹. The article discusses a number of turns of the concept of ›life‹ in the works of the German philosopher and sociologist,Geor g Simmel,the physician and advocate of a ›national biology‹, Wilhelm Schallmayer,the biologist Ernst Haeckel,and the founder of Gestalttheory, Christian von Ehrenfels. It concludes with some suggestions concerning contemporary debates about ›life sciences‹. In the 19th century,during the phase of their emergence,the cultural sciences claimed a status of autonomy,whic h was supposed to be guaranteed by the systematic reference to »Kultur-Wirklichkeit« (Cassirer). This reference and the emphasis on the idea of culture still pose an enduring challenge: On the one hand, »Kulturwissenschaft« remains a challenge for present-day cultural scientists who,as a consequence of their ideological background,do not know very often what to do with the concept of culture as such; on the other hand,it also remains a challenge for philosophy which still has to adapt itself to the contingent scope of culture. Rolf Elberfeld: Globale Wege der Philosophie im 20. Jahrhundert. 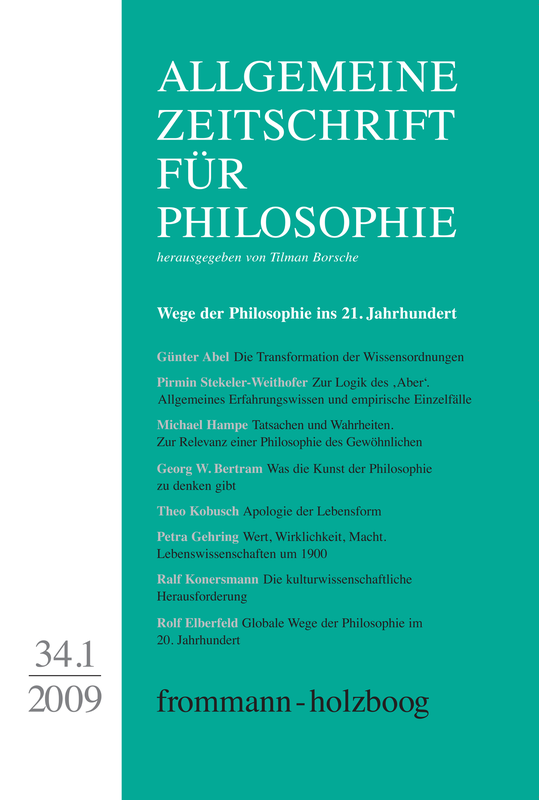 Die Weltkongresse für Philosophie 1900–2008. Twentieth century portrayals of philosophy are in most cases limited to Europe and North America. Modern developments in Asia,South America and Africa are not normally taken into consideration. When we take into account the development of the »International Congresses /Conventions« as well as the »World Congresses of Philosophy« between 1900 and 2008,howe ver,we see how the face of philosophy has become more global,despite certain parochialist tendencies in the second half of the 20th century. Retrospectively the globalisation of philosophy has been effectively established in the 20th century so that today a postcolonial philosophising has become more and more possible. This enables a new perspective on the history of thinking. Als ›streitbar‹ bezeichnet der Herausgeber der Zeitschrift im Vorwort den Artikel, und sicherlich wird Hampe mit seiner Argumentation für eine Öffnung der Philosophie nichtnormalen Diskursen gegenüber auch nicht auf einstimmiges Wohlwollen stoßen.